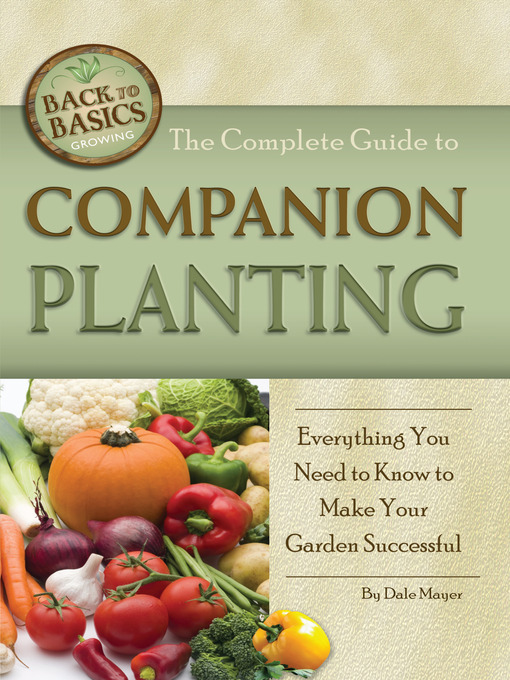 A useful gardener resource: The Complete Guide to Companion Planting by Dale Mayer. Cover image courtesy of Atlantic Publishing Group. Canadian pro gardener and GV contributor A.H. Jackson offers a few companion planting organic pest control options for keeping bad bugs at bay. Due diligence is key to protecting gardens from insect predation starting with the hunt-and-pick method and moving to hose blasting as the growing season progresses. Both work, and blasting away voracious insects with the garden hose is great therapy, until you find the leaf mold. No problem. Just stop spraying, cut away the damaged leaf and be thankful you had the foresight to plant some garden police. It is called companion planting, a tried-and-true organic method that helps gardeners control undesirable insects and avoid chemical pesticides. For example, in spite of being listed as a non-companion to nitrogen-fixing legumes by some garden writers, eggplant will actually benefit from close proximity to beans because the legumes somehow repel Colorado potato beetles. Add in some Cilantro to attract ladybugs and you have a team worth crowing about. • Dill will repel aphids, spider mites and squash bugs. • Geranium flowers will lure egg-laying cabbage moths away from the cabbage, broccoli and cauliflower. • Lettuce planted alongside radishes will deter pesky ground flies from chewing on the radish foliage. • Marigolds are both a visual delight and a mighty weapon against crop predation by many insect species, since they exude chemical repellants. The flowers can even be used as a tasty ingredient in salads and as a cheap replacement for saffron. • Nasturtiums planted near cucumber vines will deter attack by cucumber beetles and attract various predator insects that devour most garden bugs. A champion among predators is the ladybug, a cute little insect with a mighty appetite—especially for the gardener’s curse, the sap-sucking aphid. Aphids will eschew all other plants for nasturtiums, and once they pounce on it, just remove the nasturtium plant, bugs and all, from the garden. Nasturtium flowers are also a favorite of honeybees, and planting some will ensure an adequate pollination of all garden plants. Plus, their colorful flowers will add color and pizzazz to both the garden and dinner table. • Oregano repels flea beetles and a container placed near vine crops is beneficial. • Sweet alyssum flowers attract large numbers of predator insects that feed on garden pests, and butterflies love their tiny white flowers. How sweet is that? The plant can be invasive, but pulling easily keeps it in check. • Sage planted in a container and kept near cabbage, beans or carrots will repel loopers and cabbage flies. • Tarragon repels to white flies. Toronto-based Garden Variety contributing writer Alan H. Jackson offers an informed perspective on the methods, background, history and lore of food and gardening. A former food broker, greenhouse-garden center owner and golf course head gardener who has pursued rare orchids in Asia, produced bananas in South America and cultivated vanilla beans in the South Pacific, Alan has experience with everything from tropical fruit production to cold-climate vegetable farming. He is author of a dozen books, including “Beginning Gardening for Canada” (Lone Pine) and “The Canadian Food Encyclopedia” (Company’s Coming), published in October 2013. This entry was posted in Garden, Garden Pests, Uncategorized and tagged A.H. Jackson, Alan H. Jackson, Canada, Canadian, companion planting, garden, gardening, insect control, organic, Organic Gardening, pest control, The Complete Guide to Companion Planting, Toronto. Bookmark the permalink. This is a fantastic post which I am sharing on the Hot, Cheap & Easy FB page AND bookmarking. It is just what I needed to know for my vegetable planning for this season! Thanks. Despite the cold weather, people are thinking of spring – and planting gardens. Great information! Great information, especially for someone who knows nothing about gardening. Thanks for sharing. Another good book to read is Biodiversity and Insect Pests edited by Geoff M. Gurr, Steven D. Wratten and William E. Snyder with Donna M. Y. Read, published by Wiley-Blackwell. It has many suggestions and examples of what to plant to attract beneficial insects and spiders to keep pests under control. I have found that zinnias work well in repelling the bad insects and attracting the good. A great post. I think I will be using your suggestions in my garden this year.